This site is designed to keep you updated about the ongoing ROAD construction on Washington Street between Grandview Drive and Haryan Way. Listed below is the most current information. Check back periodically for construction progress. You can also contact us with any concerns, sign up for the email notification list or follow us on Facebook or Twitter. 10-23-2017: You will see crews working at the new Washington and Hainesville traffic signals this week. We are targeting a transfer from the temporary signals to the new permanent installation on Thursday, October 26th. Please use caution through the intersection when the crews are on site. Watch for flaggers and obey their directions. 9-22-2017: You will see crews on site over the next few weeks taking care of minor repairs along Washington from west of Hainesville Road to Haryan Way; work includes landscaping and concrete repairs and general cleanup. There will be a right lane closure at Haryan Way to remove and replace two small sections of pavement. You will also see work at the new Washington/Hainesville traffic signals. There will be short lane closures at those signals during work hours to adjust signal heads and install the cables that power the lights. 9-15-2017: Expect to see crews on site over the next few weeks taking care of some minor repairs along Washington from west of Hainesville Road to Haryan Way; work includes landscaping and concrete repairs and general cleanup. Please remember the work zone speed limit is still in effect. With crews moving from location to location, limited speeds protect their safety. 8-11-2017: Washington is open to traffic from west of Hainesville to Haryan Way; all lanes are open in both directions. Crews will still be working to clean up and make some minor repairs; they will complete the new traffic signals over the next few weeks. Thanks so much for your patience and cooperation during the construction of Lake County's newest roadway. 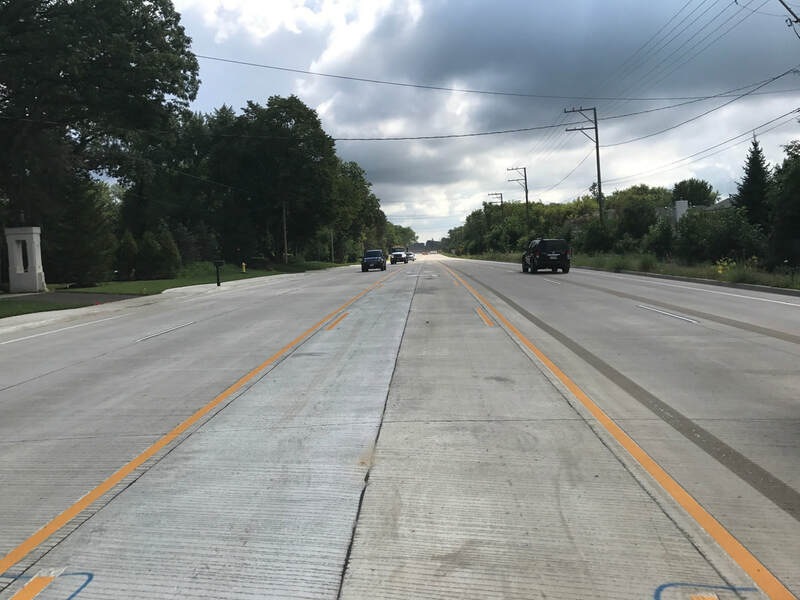 ​8-9-2017: We expect to open all lanes to traffic from Hainesville Road to Lake Street on Friday, August 11th; we are targeting an afternoon opening. There will be crews on site completing some temporary pavement marking and removing barricades and signs; please use extra caution on Friday. We will maintain the work zone speed limit for at least a few more weeks. We still have work to complete including the new traffic signals at Washington and Hainesville. Please continue to use caution as we complete the remaining work and handle final repairs. 7-31-2017: The asphalt contractor plans to complete driveways at Lakeside and the west end of the project today; the crew will also resurface the very west end of the project from Arbor towards Grandview. Please watch for crews and equipment at the west end of the project. Please watch for flaggers; they will help direct you safely through the work zone.